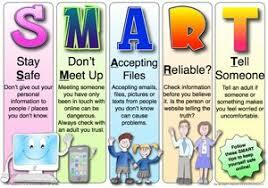 E - safety is very important with the 'new' and increased technology of today. At Ocker Hill Infant we like to keep our parents informed with new procedures and happenings in this technical world. Therefore we will bne sending out E - safety newsletters and information regularly. Also along with the school council we will be running E - safety workshops to help parents keep up to date and to offer any assistance that parents need in regards to safety online. When investigating for history topic i.e. old toys compare 2 sites as a class using BBC site or American toy seller site and identify which gives us most useful information. RBKC lesson – safe surfing with Dongle (links to several lesson plans). Dongle activity introduces pupils to the SMART rules and personal AUP (acceptable use policy) KS1 Pupil agreement on the LGfL. Use the hand poster to reinforce key safety message. Use Dongle ‘BE SMART’SONG for Safer Internet Day assembly. Flat Stanley http://www.flatstanley.com/ Join in the project of Flat Stanley, sharing photographs, videos and podcasts of Flat Stanley around the world. MeOnline (requires LGFL USO login) – Jungle club activity to select appropriate name. MLE, e.g. use discussion forum set up by school for a purpose such as School Council. Common sense – sending e mail activity 1 http://www.commonsensemedia. CEOP Thinkuknow resources: based on Hector’s World resources: (requires LGFL USO login)www.thinkuknow.co.uk/5_7/ Class pages or project areas on the school’s MLE. © 2019 Ocker Hill Infant School.